I love the beautiful yellows in this set. They are soft, yet bright, but not over powering. The gray is more of a grayish-taupe. It’s light weight, perfect for spring! This contemporary collection features an updated paisley pattern inside an ogee design for a unique look. The soft grey works as the perfect backdrop for the dusty yellow and charcoal grey printed on this 220-thread count cotton sateen fabrication. Two euro shams feature the dusty yellow color from the top of bed with white embroidery while 2 decorative pillows feature beading and embroidery details to pull this look together. 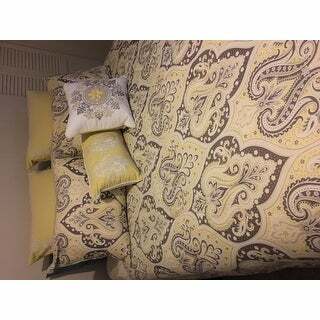 I loved this comforter the yellow is so vibrant in early spring it worked great for my master bedroom. The yellow shams on the other hand does not fit a standard size pillow. You will have to purchase a big square pillow to go in it. Very happy with this set. I was a bit concerned when my daughter said she wanted yellow bedding but was very pleased with the soft pastel colors used. Enough yellow for her while appealing to my taste as well The colors work nicely with each other and are not overpowering. The fabric is extra soft. The fit is perfect. The pillows are my daughters favorite part and it didn’t break the bank either! (My favorite thing) My least favorite thing would be that it didn’t include a matching dust ruffle- other than that I can’t find anything to complain about. Perfect for us! Absolutely beautiful! Colors exactly as shown and weight is light yet warm. Decorater pillows and shams are elegant. All materials are soft and welcoming. Highly recommend. 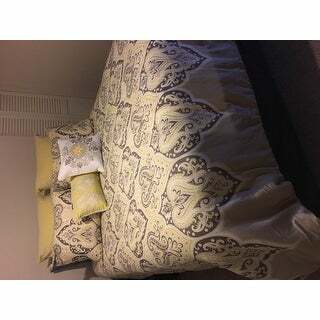 This is just what I was looking for,the bedding looks just like the picture,great pattern and colors,very soft and nice quality,fast shipping too! I have been looking for about three years for a comforter I could afford that was good quality. I love this comforter. It is great quality and looks amazing in our master bedroom. I added red accents to it and it looks like I spent a ton of money on it. Worth every penny & more. Very beautiful, had to return it because it didn't fit my décor as I thought it would! nice quality. Beautiful. Well made. Love it! Bought this as a Xmas present for my 91 year old mother in law. It is stunning and good quality. Highly recommend! Love love Love it! Its warm heavy comforter. "what color is the reverse side of this comforter?" "is this set yellow and grey or yellow and brown"
Hello jbaby, this lovely set is yellow and grey. Thank you for shopping with us.